Current Market Analysis: National bank notes from Indiana certainly aren’t romanticized or considered top trophy items. However, if you get the right mix of rarity and condition, then notes from Indiana can sell for as much money as traditionally more valuable states. Based on our experience, certain areas and towns tend to have hoarders looking to buy everything; even notes that should be common still sell for good money. Sadly, that rule only applies to about 5% of the common stuff out there. The other 95% can still be difficult to place. Pay close attention to town rarity. No single type of bank note is especially rare, the people collecting the state care about bank and town rarity over everything else. 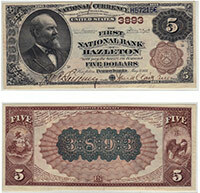 We buy all antique paper money issued by The First National Bank of Greensburg, IN. We can tell you how much your $5 bill is worth. We aren’t just dealers. We are also collectors, experts, and appraisers. We have contributed to numerous price guides and are considered specialists in the field of national currency. Contact us via phone or email to get your free appraisal today.